Marine Bernard Almond died in service, cause unknown to this archive. 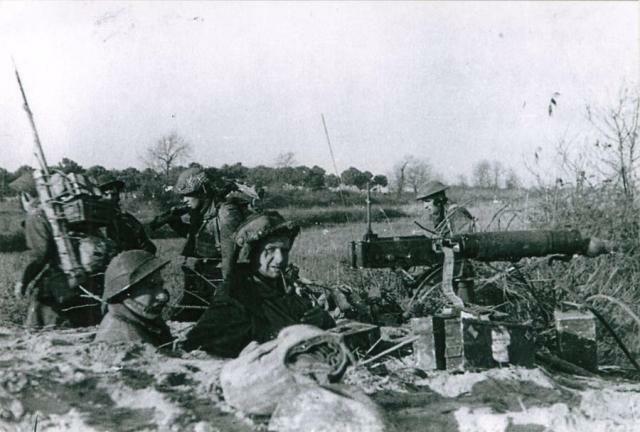 Unit shown as on AFM ROH. His death was announced in Navy News issue Aug 1961, p10, with his unit shown as 41 Commando RM. 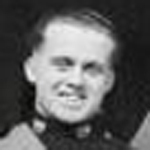 Sergeant Jack Aubertin was awarded the M.M., for gallant and distinguished services in Malaya during the period 1st July to 31st December, 1951. National Archives file WO 373/130/123. Marine Michael Baker died in service, cause unknown to this archive. 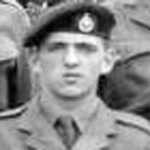 Sergeant David Baldwin died during operations in Cyprus. He, and Mne. David Whitham, were killed on July 13 1958 in the Karpas Peninsular when his patrol, landed by helicopter, and came under ‘friendly fire’. 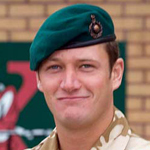 Corporal Marc Birch died whilst deployed on operations with X-Ray Company, 45 Commando Group, Royal Marines. The company was conducting an operation alongside Afghan National Army troops to dominate areas posing a dangerous threat to British forces and the local Afghan population. 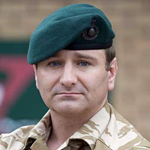 Whilst acting as Second-in-Command of the Quick Reaction Force in support of a company operation, Corporal Birch was killed by a suspected enemy suicide bomber. Corporal Andrew Bishop was awarded the MM for his actions during operations on the Falkland Islands. 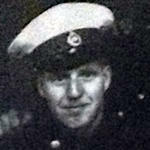 Marine Martin Blackley died in a diving accident on the 22 May 2002 at 12.15pm at the Marine Harvest Fish Farm, Aultbea. Corporal Christopher Brown received a Mention in Despatches in recognition of service during operations on the night of 11/12 June 1982 against enemy held positions on the craggy hill feature known as Two Sisters, East Falkland. 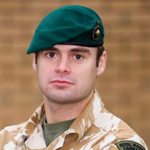 Corporal Julian Burdett was awarded the DCM for his gallantry during operations on the Falkland Islands. 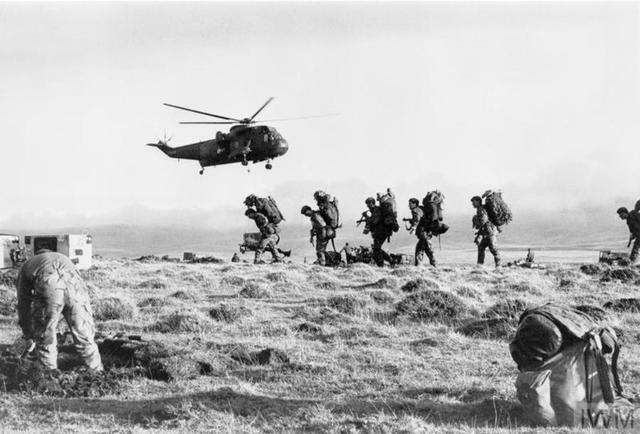 On the night of 11th/ 12th June 1982, on the Island of East Falkland, 45 Commando Royal Marines launched a silent night attack against strongly held enemy positions on the craggy hill feature of Two Sisters, ten kilometres to the west of Port Stanley. Marine Glenn Butcher died in service, cause of death not known to this archive. Marine Peter Butchers was killed in a live mortar firing training exercise on Otterburn Ranges, Northumberland. Colour Sergeant James Buxton was awarded the British Empire Medal (Military Division), for gallant and distinguished service with 45 Commando, Royal Marines, in Malaya during the period 1st January to 30th June, 1952. London Gazettes Supp. 39675, page 5527. National Archives file WO 373/131/73. Lieutenant Christian Caroe received a Mention in Despatches  in recognition of his service during operations on the 12th June 1982. Quartermaster Sergeant Graham Casey died during operations in Cyprus. He was killed in a helicopter accident during anti-terrorist operations in the Troodos Mountains. Marine William Cates died in Libya. The cause of his death is not known to this archive. 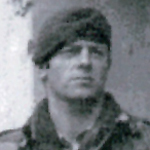 Captain Michael Cole, commanding 'Z' Company, received a Mention in Despatches during operations against enemy positions on the feature known as Two Sisters on East Falkland. 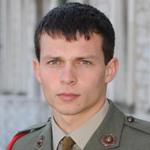 Corporal Michael Coleman died in a canoe accident at Cawsand, Cornwall. Also killed were Mne. Michael Perry and Mne. Percival Newland. Quartermaster Sergeant Frank Collingwood was awarded the B.E.M. (Military Division) for distinguished service in operations against terrorists in Cyprus between 1955 and 1956..
National Archives file WO 373/126/17. Lieutenant Colonel Richard Crombie was appointed O.B.E. (Military Division), in 1963 . Marine David Davidson was awarded the M.M., for gallant and distinguished services on the 6th November 1956 during Operation Musketeer, the Anglo-French Invasion of Port Said, Egypt. Sergeant Donald Davies died as a result of a traffic accident. Mne. William Masters also died on this date in a traffic accident and is also buried at Moascar. Corporal Hadyn Davies received a MiD for distinguished services in operations in Cyprus during the period 1st July to 31st December, 1957. London Gazettes Supp. 41305, page 851. 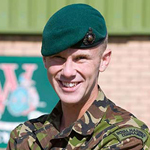 Lieutenant David Dunn, HQ, died during a joint training exercise in Northern Scotland. He was on board a helicopter operating from HMS Intrepid when it crashed. Also killed were Lieut. Paul Farley and Lieut. Andrew Macdonald. Corporal Nicholas Eaton died in service, cause of death not known to this archive. 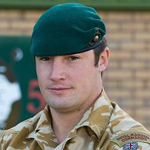 Corporal Liam Elms, 45 Commando Royal Marines, Zulu Company, died as a result of an enemy ied explosion during operations in southern Helmand. The Company was conducting a local area patrol alongside Afghan National Army troops in order to reassure the local population. Sergeant Roger Enefer died during an enemy bombing attack whilst on operations at Ajax Bay, Falkland Islands. Corporal Kenneth Evans died during an enemy bombing attack whilst on operations at Ajax Bay, Falkland Islands. 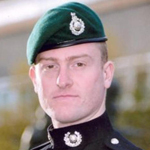 Lieutenant Paul Farley died during a joint training exercise in Northern Scotland. He was on board a helicopter operating from HMS Intrepid when it crashed. Also killed were Lieut. David Dunn and Lieut. Andrew Macdonald. Lance Corporal Steven Fellows was part of a patrol in the Green Zone south of Forward Operating Base Jackson when a Jackal vehicle struck an improvised explosive device in the Helmand River Wadi. All three of the vehicle occupants were wounded with LCpl Fellows’ position as the vehicle commander taking the full brunt of the explosion. Despite a rapid withdrawal to the Forward Operating Base’s medical facility, and subsequent evacuation by helicopter, LCpl Fellows was pronounced dead without regaining consciousness. Lance Corporal John Ferguson died in service, cause of death not known to this archive. Marine Murdoch Findlay died in service whilst deployed overseas, cause of death not known to this archive. 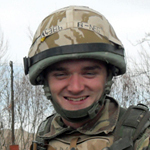 Warrant Officer Class 2 Andrew Forret, 'Z' Company, died during the annual deployment to Norway. He was sitting in the cab of a BV 202 oversnow vehicle in which he had been awaiting the return of an overdue patrol group in atrocious weather. He was poisoned by exhaust fumes on a faulty vehicle. Marine Kevin Frankland died in service, cause of death not known to this archive. Marine Hugh Fraser died in service, cause of death not known to this archive. Marine Leonard Goldsmith received a Mention in Despatches in recognition of service during the operations in the South Atlantic. Colour Sergeant Norman Grant died in service whilst deployed overseas, cause of death not known to this archive. Marine Raymond Greening died in an ambush near Sarandi, Cyprus. Marine Thomas Hall died in service, cause of death not known to this archive. Marine Carl Harrison died in a traffic accident on the Arbroath to Friockheim road near to RM Condor. Major Jesse Haycock was appointed O.B.E., (Military Division), in 1976 . Marine Anthony Helstrip was killed in a live mortar firing training exercise on Otterburn Ranges, Northumberland. Also killed were Mne. Peter Butchers and Mne. Glenn Miller. 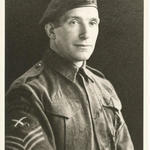 Regimental Quartermaster Sergeant Percy Howard died whilst deployed overseas, cause of death not known to this archive. Captain David Hunter was awarded the M.C., for distinguished service in operations in Malaya from 1st August 1950 onwards. National Archives file WO 373/129/119. Marine Norman Husband died in Hong Kong. He is buried in Hong Kong Cemetery, formerly known as HK Happy Valley Cemetery and HK Colonial Cemetery. Marine Luke Ireland went missing whilst on leave after going for a run in the Glen Clova area. Despite an extensive search involving Tayside Police, five Mountain Rescue teams, three rescue dogs, search helicopters and 250 Royal Marines and Army commandos, the rescue attempt, in appalling weather, was unsuccessful. 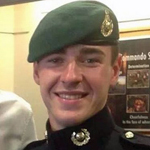 Police later confirmed that a body found in the Angus Glens was that of the missing Royal Marine. AFM ROH / MOD / BBC Tayside and Central Scotland online. Marine Frank Jennings died in service whilst deployed overseas, cause of death not known to this archive. Marine Alfred Jones died in service whilst deployed overseas, cause of death not known to this archive. 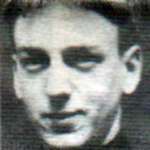 Marine Kenneth Lamb died during operations in Cyprus. He was accidentally shot and killed on anti-terrorist operations in the Troodos Mountains during the Cyprus emergency. They were reinforcing a Greek Police Station in Agros at the time. Marine Michael Laski died of the wounds he sustained in action on 23 February 2009 to the north of Sangin, Helmand province, Afghanistan. He passed away peacefully at Selly Oak Hospital in Birmingham on 25 February 2009 with his family beside him. 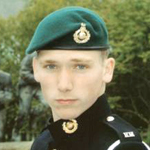 Sergeant Robert Leeming was killed during operations on the Falkland Islands. Sergeant Alan Lever died in service, cause not known to this archive. Marine Alexander Macdougall died in a road ambush near Amiados in the Troodos Mountains, Cyprus.